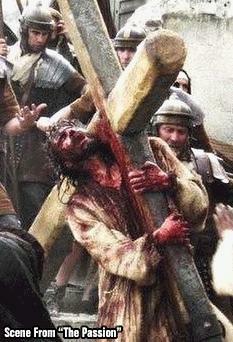 Mel Gibson's movie "The Passion" set out to be a statement and work-of-art with the simultaneous desire to exhibit the Gospel message in a unique form for film (produced entirely in latin and aramaic languages without subtitles), centered on the affliction of Jesus of Nazareth at the hands of his persecutors some 2000 years ago. The first controversy which stirred about this film was that it would, unlike its predecessors in cinema, 'tell it like it is,' a no-holds-barred bloody spectacle... because that is precisely what happened to Jesus; the vicious prison beatings - his beard plucked from his face, the public lashing with a device designed to shred away flesh down to the bone -- 39 times -- to the crushing ordeal of carrying his cross through the streets while being spat upon, pelted with stones and shards of glass, to the literal nerve-splitting, excruciating crucifixion; that's where the word comes from -- "ex" = out of & "crusia" = the cross. The ordeal of Christ's unjust torture and murder by his conspirators through the agency of the Roman government is intrinsic to the story. Even the Apostle Peter, a Jew, did not hold back in his excoriation of what they had done: "But ye denied the Holy One and the Just, and desired a murderer to be granted unto you; And killed the Prince of life, whom God hath raised from the dead; whereof we are witnesses" (Acts 3:14-15). The history, politics and iconoclastic nature of Jesus' revolutionary message to the Jews is pivotal. Inexpendable. For any one element to be removed, diminishes the whole. The next big controversy centered around Gibson's personal motives for making the film, attacks on his personal life, past, even his family began to surface. Out of this the well known stench of Jewish Defense League and ADL mindlessness began to waft through the air. Sure enough, it was eventually revealed the Gibson and company were being intimidated and harassed by Jewish groups in a snit to 'change' his film -- and alter history -- to make Jews more comfortable with their historic role in the death of the man who single handedly changed western civilization forever. The audacity alone is astonishing, but not surprising. Not anymore. Meanwhile, Ernst Zundel, in failing health, rots away in a Canadian jail cell while a confederacy of Orwellian dunces attempt to prosecute him for his 'thoughts,' clearly to make an example of him to anyone who would dare question the accuracy of Holocaust numbers or demand historical veracity. Meanwhile Mordechai Vanunu is spending his 12th year in an Israeli maximum security prison for daring to speak out about Israel's secretive nuclear program in what is hailed by the U.S. as the shining example of 'democracy' for the mid-east. Meanwhile David Icke is being systematically pursued and persecuted by deranged anti-defamation squads and other fascist groups along his lecture and books tours because they believe his speaking of "reptilian" alien beings is code-speak for "Jews" trickled out to a clandestine neo-nazi organization disguised as Icke/UFO/NWO aficionados. Gibson and company have clearly caved in to Jewish influence and demands and "softened" the film, extracting scenes and circumstances which cast Jews in an unfavorable light, be it historically valid or not. Gibson started off as a true firebrand in this endeavor, with a passion for his 'passion' -- for him to be suddenly and skillfully nipped in the bud on this work of art must have more to do with mere money, public relations or civic minded-ness. No, it is clear, considering the atmosphere of our times, something far more disturbing in skullduggery is going on behind the scenes. Someone is likely being threatened with physical harm. There are times when one can just sense that something more is happening beyond the veil, and this is one of them. When people suddenly go coldly silent, when they hack off whole limbs of their statues, rewrite entire plays, find themselves on a blacklist... someone somewhere has been pushed into that corner of suffering extortion on a level no one should have to face. There are those who don't believe such power exists nor is wielded in this world. Those people are simply fools. This is not going to stop. Jewish "defense" organizations and those who sympathize with them are steadily crucifying one person after another, one voice after another, one artwork, author, play, expression, political party, politician or public servant after another on their cross of coerced appeasement. They don't give a damn about the Constitution, the Bill of Rights, freedom of expression, freedom of speech or religion -- they don't give a damn about anyone or anything but themselves, and even THEY don't represent JEWS! They are entirely self-appointed overseers of some nonexistent Jewish mythos that lays claims to everything from holy land to moral absolution on the world stage to justification of racist/Apartheid government to media control over how Jews are treated in an industry their own people, for the most part, seemingly control. These people are in severe denial, history has no meaning to them, truth is of no value whatsoever. The truth be damned, so long as a star chamber of Jews have their way. Gee... is this scenario FAMILIAR or what??? They are a tiny group of extremists; powerful, evil, unrelenting social dictators who have discovered that they can trump the game anytime they want with the 'Jew card' and pull everything to a sickening, deafening stop, and silence not only their critics but alter history and art and politics to their own twisted bent. And what's worse, their actions bring about untold persecutions by thickheaded racist morons who are their anti-thetical equal opposites, bent on persecuting every Jew for what this powerful minority of Jews do in their name. These people and these organizations need to be exposed, defied at every turn and legally destroyed before they utterly dominate every aspect of our lives. These are serious times. There are serious consequences to complacency. It can last just so long before their cries of "anti-semitism" and "nazi" to rouse the ire of the sensitive soon fall on scolded ears who have also felt their unrighteous indignation as they burn everything of truth in their path toward the ultimate victory of complete control. But before it reaches that point, we have to do something about it. Speak up, speak out, sacrifice what is necessary for truth. Gibson needs to. I expected him to. He has failed. He is clearly unwilling to take the cup offered him. We all need to. Or the tentacles of this insidious monster will squeeze and crush out every bit of life and light left in this world.